Church St. & Pamplico Hwy. For Sale All Locations, South Carolina, Florence Church St. & Pamplico Hwy. 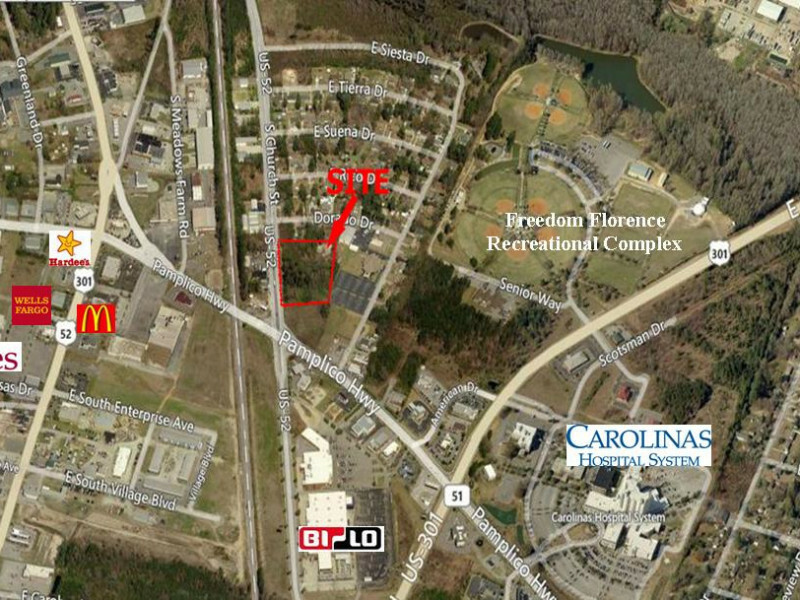 This commercial development site is located on Church St. just off Pamplico Hwy., one of Florence’s strongest and most established commercial corridors. The area offers many commercial services including grocery shopping, banking, restaurants, convenience stores, and a host of other professional and medical offices. The immediate area is home to Carolina’s Hospital System, Lowe’s Home Improvement, Bi-Lo Center, and Freedom Florence. The site allows easy access from Church Street with great visibility from Pamplico Hwy. The property has approximately 487 feet highway frontage on Church Street. The site is served by municipal water. Current traffic counts stand at approximately 23,400 cars per day on Church and 28,300 cars per day on Pamplico Hwy. The Site is For Sale at $675,000.